If you enjoyed connecting with others in the home building and Carolina real estate industries on RealtyJoin, then you’ll love the new and enhanced RealtyJoin version 2.0 that offers even more opportunity network. RealtyJoin is the first social networking site for the entire real estate industry, serving buyers, sellers, architects, contractors, brokers, suppliers, investors, builders, designers, agents, REALTORS® and other industry professionals in the United States and Canada. 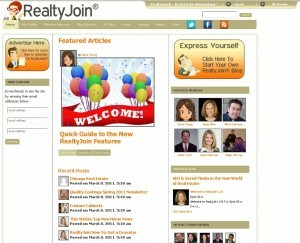 The redesigned site does everything that the original version of RealtyJoin did, but better. RealtyJoin 2.0 is user-friendly and includes upgraded navigation, enhanced profiles, video options and the ability to add photos and post status updates. There is even a WordPress blog for every user for enhanced social networking and improved interaction. Plus, RealtyJoin users have the opportunity to connect with many high profile real estate groups including the Atlanta Board of Realtors®, Foreclosure.com, Southeast Valley Regional Association of Realtors® and RIS Media as well as award-winning and nationally syndicated columnist, blogger, bestlling author and radio talk show host Ilyce Glink. The best part is- you get all of these great features and opportunities for free at the introductory level. For those who wouldlike further upgrades and enhancements, RealtyJoin will launch premium and executive memberships over the next several months. For more information about RealtyJoin 2.0, visit the website, “like” RealtyJoin on Facebook or follow RealtyJoin on Twitter. This entry was posted in New Home News, People, Technology and tagged Carolina real estate, internet marketing, RealtyJoin, social media, social networking site on March 8, 2011 by admin.